Europeans and indigenous Americans traded, negotiated, cooperated, and intermarried with one another. They also came into violent conflict. In Virginia and New Mexico (as well as New England), there came a moment when indigenous people rose up in coordinated offensives. 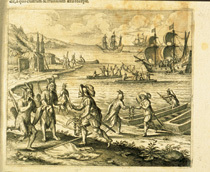 No such war occurred in New France, however, where the small French population, limited demands on Native land, and policies of alliance put less pressure on indigenous societies. The Virginia Company's initial business plan called for trading copper for corn. They hoped the settlers might dominate the Powhatans and appropriate the valuable tribute that subsidiary nations customarily paid to the strongest Powhatan leader, Wahunsonacock. In turn, Wahusonacock planned to fit the new arrivals into his existing system of alliances as another subordinate group. These plans created conflict from the earliest years. Relations deteriorated as the English grew in numbers and sought land for planting tobacco. Bartholomew Gosnold was captain of the Godspeed, largest of the Virginia Company’s three ships. Theodore de Bry’s America shows him trading with Native people of New England in 1602 during an expedition in which he gave English names to Cape Cod and Martha’s Vineyard (for his daughter). Reproduction. The French depended on Native allies for the success and survival of their settlement. Trade and gift giving were essential to sustaining the fur trade and maintaining the military alliances that compensated for the colony’s small European population. French fur traders and political leaders adapted to the trading protocols and diplomatic forms of the Hurons and others, including ritual gift giving to seal agreements and create mutual trust. 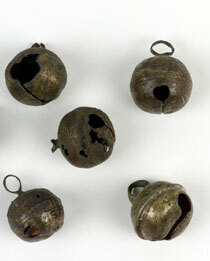 Brass bells such as these from a Native settlement in Onondaga, New York, c. 1654-81, were common trade items worn by Native people on necklaces, on clothing, or in the hair. Combs, knives, needles, mirrors, and other items brought by the Spanish proved desirable to the Pueblos. These goods came via the camino real, a route that stretched roughly 1,500 miles south to Mexico City. Pueblo peoples exchanged traditional pottery for European items such as these shears. Settlers and Pueblos also traded foodstuffs, hides, livestock, jewelry, and woven blankets with Apaches and Navajos in the region. Hand-forged iron shears, seventeenth century, collected in New Mexico. Museum of Spanish Colonial Art, Collections of the Spanish Colonial Arts Society, Inc.